The CDC warns of ‘large outbreak’ of measles … let’s hope they handle this better than Ebola. CDC Director Tom Frieden said on CBS’s “Face the Nation, ” We are very concerned by the growing number of people who are susceptible to measles, and the possibility that we could have a large outbreak in this country as a result.” Wait a minute, I thought measles immunization of children was mandatory? Frieden urged parents to immunize their children. 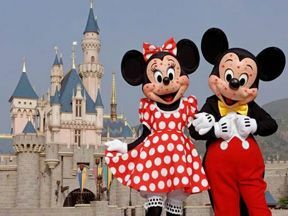 Centers for Disease Control and Prevention (CDC) Director Tom Frieden on Sunday warned that the U.S. could see a “large outbreak” of measles. Frieden said there is “aggressive public health action” to identify those with measles, isolate those sick and quarantine those who have been exposed. Frieden said despite the U.S.’s 92 percent vaccination rate, there is growing evidence more parents are not vaccinating their children. Flu Vaccine Only 23% Effective this Year … Do We Even Get to Call that Effective? Hey America, aren’t you glad you got a flu shot that is only 23% effective? US health officials at the CDC have stated that this years flu vaccine has one of the worst effective rates in the last decade. It amazingly has only a 23% effective rate primarily because it does not combat against the flu strain that has been making most sick, the H3N2 virus. Oops. That particular flu strain has caused 2/3 of the illnesses. This might surprise many people. Each year the flu vaccine is reformulated, based on experts’ best guess, at which three or four strains will be the biggest problem. THEY GUESS?!? Are you kidding me? So between the US population and an influenza flu pandemic we have a bunch of “experts” throwing darts at a dartboard and grabbing names out of a hat to determine what makes up the flu vaccine. Hmm, how did that work out for us? As predicted, this year’s flu vaccine is doing a pretty crummy job. It’s only 23 percent effective, primarily because it doesn’t include the bug that is making most people sick, according to a government study released Thursday. That’s one of the worst performances in the last decade, since U.S. health officials started routinely tracking how well vaccines work. In the best flu seasons, the vaccines were 50 to 60 percent effective. “This is an uncommon year,” said Dr. Alicia Fry, a flu vaccine expert at the Atlanta-based Centers for Disease Control and Prevention, who was involved in the study. The findings are not surprising. In early December, CDC officials warned the vaccine probably wouldn’t work very well because the it isn’t well matched to a strain that’s been spreading widely. Each year, the flu vaccine is reformulated, based on experts’ best guess at which three or four strains will be the biggest problem. Those decisions are usually made in February, months before the flu season, to give companies that make flu shots and nasal spray vaccine enough time to make enough doses. But this year’s formula didn’t include the strain of H3N2 virus that ended up causing about two-thirds of the illnesses this winter. And that strain tends to cause more hospitalizations and deaths, particularly in the elderly, making this a particularly bad winter to have a problem with the flu vaccine. 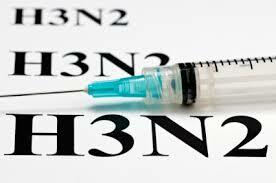 CDC Says H3N2 viruses fuel ‘epidemic’ levels of flu season deaths. Deaths due to influenza and pneumonia have hit “epidemic” levels in the U.S. as flu activity became widespread in 36 states, according to the Centers for Disease Control and Prevention. Officials reported 837 flu and pneumonia deaths to the CDC through its 122 Cities Mortality Reporting System during the 51st week of the year. Those deaths accounted for 6.8% of the 12,358 total deaths that week, just meeting the epidemic threshold. 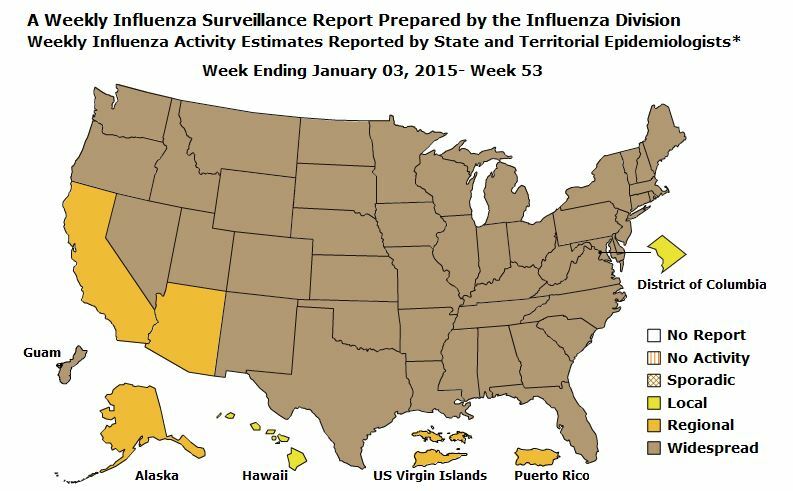 Influenza activity was considered “widespread” in 36 states during week 51, according to the CDC’s most recent FluView report. These states included Arkansas, Colorado, Connecticut, Delaware, Florida, Georgia, Illinois, Indiana, Iowa, Kansas, Kentucky, Louisiana, Maryland, Massachusetts, Michigan, Minnesota, Mississippi, Missouri, Montana, Nebraska, New Hampshire, New Jersey, New York, North Carolina, North Dakota, Ohio, Oklahoma, Pennsylvania, South Carolina, South Dakota, Tennessee, Texas, Virginia, Washington, Wisconsin and Wyoming. GOOD GRIEF ARE YOU KIDDING ME … WHAT IS IT GOING TO TAKE TO TAKE EBOLA SERIOUSLY AND THOSE EXPOSED TO IT … A FULL FLEDGED PANDEMIC? EBOLA COMES TO THE BIG APPLE … 33 year old Craig Spencer, a Doctors Without Borders physician, who recently returned to the United States after treating patients in Guinea, West Africa was rushed to Bellevue Hospital with Ebola-like symptoms. Craig Spencer returned to NYC and landed at JFK International airport on Oct. 17. According to accounts, Spencer’s temperature was 98.7 degrees upon arrival. Looks like the new so-called protocols of people entering the country are garbage and do not properly screen for Ebola. Hmm, haven’t we been saying that for how long? What part about a 21 day quarantine for those healthcare workers who have been exposed to Ebola is such a difficult concept to grasp? Also, when are healthcare workers going to act more responsibly, themselves? Craig Spencer and his fiancee have been isolated. This is some what unreal that a doctor who knows the risk of Ebola would subject others and his own fiancee to the disease. A 33-year-old Doctors Without Borders physician who recently treated Ebola patients in Guinea was rushed in an ambulance with police escorts from his Harlem home to Bellevue Hospital on Thursday, sources said. Craig Spencer, who was was suffering from Ebola-like symptoms — a 103-degree [SM editors note: correction, 100.3 degree] fever and nausea — spent Wednesday night bowling in Williamsburg, the sources said. He used Uber taxis to get there and back. He landed at JFK airport on Oct. 17 on a connecting flight from Brussels, a source said. Spencer’s temperature was 98.7 degrees upon arrival, the source added. Spencer had been working with Doctors Without Borders in Africa, treating Ebola patients in Guinea, sources said. He’s undergoing testing at Bellevue to see if he has the deadly virus. “After consulting with the hospital and the CDC, DOHMH has decided to conduct a test for the Ebola virus because of this patient’s recent travel history, pattern of symptoms, and past work,” the Health Department said. Test results should be available in the next 12 hours, they added. When are we going to take this fatal disease seriously, does the Obama administration want America to become like West Africa, riddled with Ebola? Stop the PC nonsense and get serious, stop travel from affected countries and provide 21 day mandatory quarantine for those healthcare workers and military forces who have to provide care in these areas. 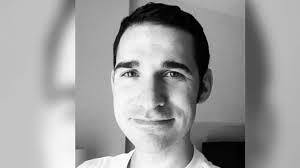 Craig Spencer returned from Guinea, Africa 10 days ago before showing Ebola-like symptoms. NYC Mayor de Blasio says there is no reason to be alarmed. REALLY? Spencer rode the A, L, and No. 1 subway lines, went running, used an Uber livery cab, and went to a bowling alley in Williamsburg called the Gutter. The bowling alley has since been closed and many unsuspecting NY’ers who rode on the same subways are now concerned. Limited contact, do you know how many people there are in New York City? There is no such thing! Since returning from Africa, Spencer rode the A, L, and No. 1 subway lines, went running, used an Uber livery cab, and went to a bowling alley in Williamsburg called the Gutter Wednesday night, said Dr. Mary Bassett, the city’s health commissioner. He also visited the High Line park in Manhattan at some point, she said. He began exhibiting a fever and diarrhea on Thursday morning. Mayor Bill de Blasio said that the man had limited contact with others since coming back from Africa and was working with health officials to identify them. One of those was his fiance, who was also brought to Bellevue. The mayor also cautioned New Yorkers that their chances of contracting Ebola are very slim, even if you were on the subway with Spencer. But of course Obama is not taking it seriously, he appointed a political operative to be the Ebola czar, rather than some one with healthcare and healthcare management experience. 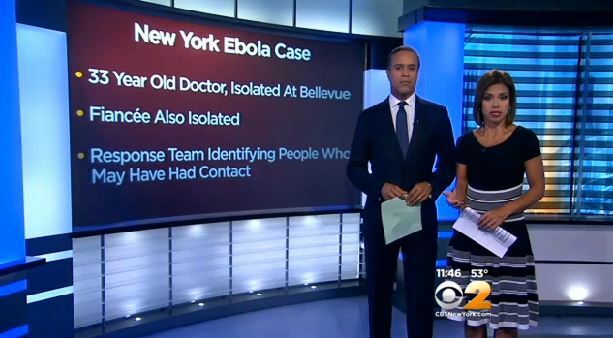 New York City Doctor Tests Positive For Ebola – Doctor’s Fiancee, 2 Friends Healthy, But Being Quarantined. US Rep. Steve Scalise(R-LA) confronted CDC Director Frieden over the Ebola situation and putting a travel ban in place or at the very least to stop issuing visas to individuals from Liberia, Sierra Leone and Guinea to the US. The answers that he received from the CDC Director were nothing short of political stonewalling and non-answers. How can there not be a travel ban from individuals from West Africa, after all … that’s how other African countries saved themselves, they closed their borders. So if it was good for African countries to do so, why is it also not okay for America? What is Obama’s issue and agenda? During the hearing the CDC director claimed that CDC was open to travel ban. Hmm … but is Obama and will it be too late if he finally is forced to?